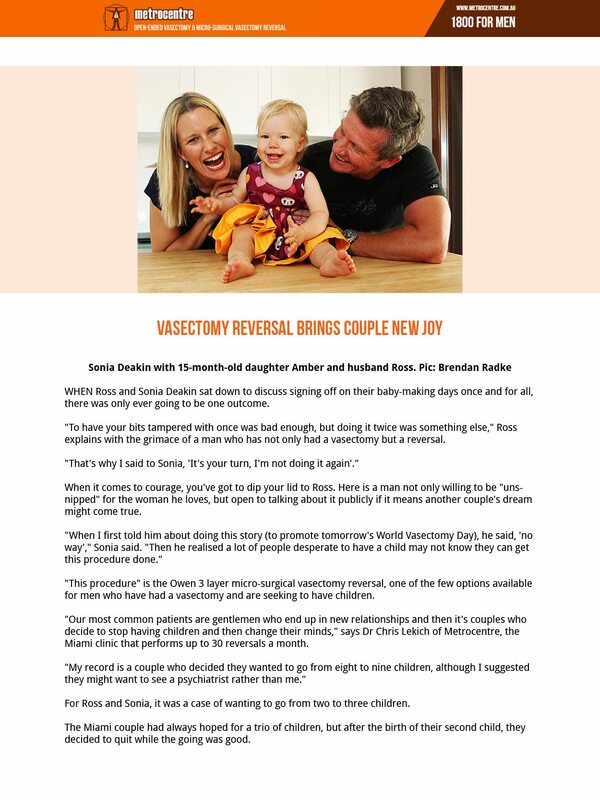 Metrocentre's Vasectomy Reversal Procedure Creates Another Family! 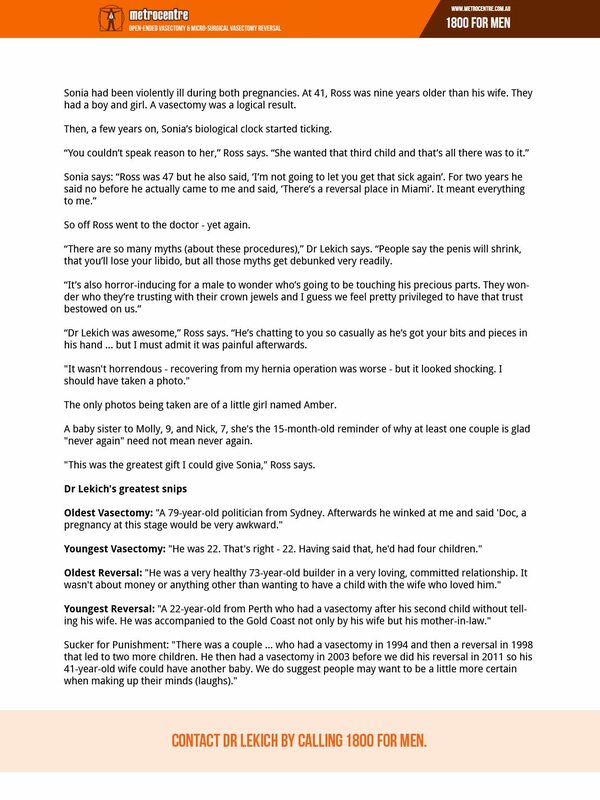 Metrocentre was recently featured on goldcoast.com.au, after Dr Chris Lekich performed a vasectomy reversal – inspired by the microsurgical techniques of his mentors. Ross and Sonia Deakin were one of many couples who changed their minds after undergoing a vasectomy procedure. Ross had already undergone a vasectomy when the couple decided that they once again wanted to have a child. 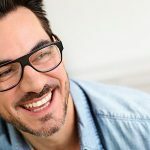 In order to reverse his decision for no more children, he decided to see Dr Chris Lekich, who is renowned for his advanced vasectomy reversals inspired by microsurgery. This procedure is called the Owen 3 Layer Micro-surgical vasectomy reversal and was passed down by his primary mentor Professor Owen. The procedure itself involves 3 layers of suture, to account for the three layers of the vas tube which includes the inner intima, the middle muscular and the outer advential layer. 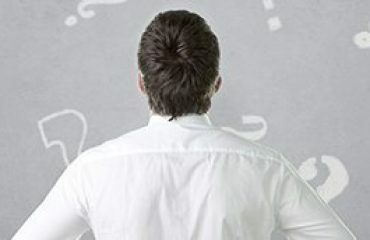 This procedure ensures maximum precision and a stronger bond between the two ends of the vas tube which will increase your chances of a successful vasectomy reversal. Find out more about the owen 3 layer microsurgical vasectomy reversal procedure here. 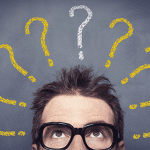 Have you been through a similar change of mind and want a vasectomy reversal? Metrocentre has locations in Brisbane, Sydney, Melbourne and the Gold Coast for your convenience. If you’re out of state or from a different country we can also ensure that your stay with us will be comfortable and stress free. Contact Dr Chris Lekich on 1800 FOR MEN today. 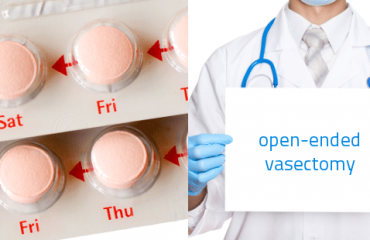 Is a Vasectomy The Right Choice For You?